Our rope course is the perfect physical and emotional activity for children and their families. Built on two levels, it accommodates children of all ages and abilities allowing them to overcome their fears and push the limits of their potential. There are many publications that support the therapeutic benefits of the use of rope courses for the holistic development of all children. Self-efficacy, self-confidence, locus of control (the ability to believe he/she can change his/her own destiny), self-control, development of eye-hand coordination (an ability that experts think our children are losing), and self-awareness are only a few benefits of such courses. Combine the value of the rope course with St. Mary’s stunning architecture, and you’ll understand the Dragon’s Den’s ability to inspire hope and create success. It provides a rare opportunity for all children, but especially for those in neighborhoods on the rebound from economic destabilization. Rope courses, also known as challenge courses, first appeared in Europe and are becoming more popular in the United States. The intrinsic therapeutic components of rope courses, or suspended obstacle courses, are designed to have a beneficial effect on increasing participants’ self-awareness, self-efficacy, self-confidence, social maturity, trust, respect, responsibility, and especially, self-control. The Dragon’s Den’s rope course has been designed and planned (for free!) by Lucio Longhi and Patrizia Corti, two very talented and generous designers who have believed in the importance of the Dragon’s Den’s mission from the start. Through their rope course in Italy, they witness, the benefits of the rope course for children with different abilities. Having worked in the industry for nearly 20 years, these professionals immediately understood the Dragon’s Den’s vision; they accepted the founder’s invitation to travel from the province of Lecco, Italy to Homestead, PA to assist with the course’s design. Within three weeks, the unique Dragon Den’s challenge course design was complete! 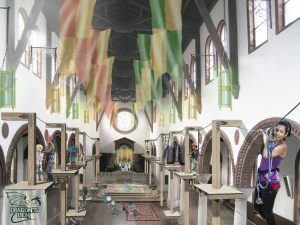 The Dragon’s Den’s custom-designed rope course will be built around the beautiful historic architecture of the previous St. Mary Magdalene Church in Homestead, PA. Children and families will closely observe and enjoy intricately carved woodwork, capitals, terracotta details and arches, all while overcoming their personal limits. The course, adapted to age and capacity, will be strategically built on two levels (high rope course and low rope course). The low rope course will appear to be very similar to the high rope course. This component of the design has the specific benefit of building inclusion and confidence in younger children and children with physical and cognitive impairments, who would not otherwise be able to use the rope course. Children using the lower rope course will believe they are going through the same challenges, only at a lower height. Avoiding feelings of inadequacy among the children is of paramount importance at the Dragon’s Den. The low part of the challenge course will also be used for programs that promote team building among the participants. 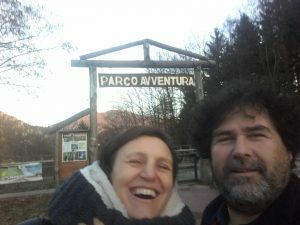 If you plan to visit Northern Italy, please visit our sister park “Parco Avventura Resinelli”, an outdoor rope course like you have never seen. Surrounded by breathtaking mountain peaks, it is 20 minutes from the stunning Lake Como! Help make a great idea a reality! Support the Dragon's Den. Our vision comes true thanks to the generous support of parents, community members and supporters just like you.